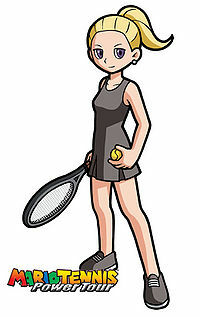 Emily is a female character first appearing in the Game Boy Color version of Mario Tennis. She later appeared in Mario Tennis: Power Tour. She has blonde hair in a ponytail and black eyes, and wears a tank top, mini skirt, and tennis shoes - all black. In Mario Tennis she was depicted with a tan, but this was not carried over to Mario Tennis: Power Tour. In the Game Boy Color game, Emily is a ranked member of the Varsity Class at the Academy. Alex or Nina faces her in the semifinal round of the Island Open singles tournament. In the doubles tournament, her partner is Kevin, and they lose to A. Coz and B. Coz from Factory in the semifinal round. Emily had an ability to do a large dash to return the tennis ball. In the Game Boy Advance game, she's the coach of the Senior Class. Here, Emily is shown to be a very serious person who can see potential quite easily, but is careful to avoid making players overconfident. But she also mentions that a lack of confidence makes her uneasy. This page was last edited on April 21, 2019, at 13:21.